How do you Survive an Economic Collapse? In case you haven’t been following the news lately, Greece is once again falling apart at the seams. There is panic in the streets as Greeks scramble to pull their meager savings from the banks, and shortages of food and medicine are beginning to mount. In short, Greece is on the brink of collapse, and they’re far past the point of no return. Fortunately, there is something we can learn from this whole situation. Greece isn’t the only country that may face a complete collapse of their economy, and it would be wise to observe the actions everyday people are taking to insulate themselves from the chaos. You’ll likely find that some of the things Greeks are doing to stay alive, are quite similar to the strategies that are often suggested by Ready Nutrition, as well as other prepper websites. Chief among them, is leaving the city and learning how to grow your own food. KARITAINA, Greece (AP) — Ilias Mathes has protection against bank closures, capital controls and the slashing of his pension: 10 goats, some hens and a vegetable patch. If Greece’s financial crisis deepens, as many believe it must, he can feed his children and grandchildren with the bounty of the land in this proud village high in the mountains of the Arcadia Peloponnese. The production of food and milk gives villagers in many parts of Greece a small measure of confidence — and a valuable buffer. For many Greeks, the countryside has become a refuge. They can achieve a degree self sufficiency that they would never have in the city, and they can survive despite their tremendous debts. There is also a sense of community that you would never find in the city. With money being so hard to come by, that makes a pretty big difference. The villagers can easily trade the homemade foodstuffs they need to survive. Of course, Greece isn’t the only example of how breaking away from the system can save you in a crisis. The collapse of the Soviet Union created many of the same conditions that Greeks are faced with today, and that we also may have deal with someday. One of the best documents on this subject was written by Dmitry Orlov during 2005 (when peak oil fears were much greater than they are now, and it shows in his writing). He witnessed the collapse of the Soviet system, as well as the recovery that soon followed, and among his vast account is an interesting tidbit about how everyday Russians managed to keep themselves fed during this calamity. The dismal state of Soviet agriculture turned out to be paradoxically beneficial in fostering a kitchen garden economy, which helped Russians to survive the collapse. At one point it became informally known that 10% of the farmland — the part allocated to private plots — was being used to produce 90% of the food. Beyond underscoring the gross inadequacies of Soviet-style command and control industrial agriculture, it is indicative of a general fact: agriculture is far more efficient when it is carried out on a small scale, using manual labor. 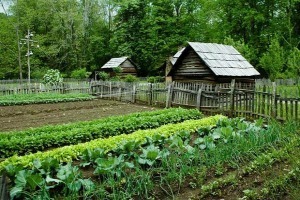 Russians always grew some of their own food, and scarcity of high-quality produce in the government stores kept the kitchen garden tradition going during even the more prosperous times of the 60s and the 70s. After the collapse, these kitchen gardens turned out to be lifesavers. What many Russians practiced, either through tradition or by trial and error, or sheer laziness, was in some ways akin to the new organic farming and permaculture techniques. Many productive plots in Russia look like a riot of herbs, vegetables, and flowers growing in wild profusion. Make no mistake, the nation of Greece is in for a world of hurt that has been experienced by many nations in recent history, and someday soon, other developed nations like the US, may feel that same pain. But take note of how these people are dealing with the crisis. Those who have the means and the know-how to provide for themselves, stand a much better chance of enduring the crisis. A man who loves his family, his friends, and his country. Hoping to provide a meaningful resource of information for the average family to utilize in cases of emergency.